While neutral colors have always been a top choice when choosing a paint color for the walls inside a home, shades of light blue and pale grey have overtaken white and beige for the most popular choice. These changing design trends have resulted in many homeowners choosing to paint the various rooms in their home blue. However, designers and buyers have chosen a favorite shade of blue for each area of your home. Light blue is a top choice for bathrooms of all sizes—particularly those with white trim and tiles. Choosing a periwinkle blue or another light shade of blue for your bathroom can help to raise the sale price by an impressive $5,440. Slate blue is a popular choice for dining rooms. On average, making this choice can boost your home’s sale price by nearly $2,000 when comparing it to homes with dining rooms painted in another color. The best choice for your kitchen is a soft, grey-blue. Paired with white trim and bright lights, this can produce an inviting room that will help your home sell for a premium of around $1,800. While most people associate navy blue with a nautical theme, it has recently become a top choice for the color of your front door. Since the door is a relatively small area of your home, it is safe to use a bolder shade of blue than you might use in other, larger areas of your home. Making this daring choice can fetch a profit of $1,500 when it comes time to sell your home. Cadet blue is a shade of cerulean blue that is a popular option for your bedroom walls. This choice works well with brightly colored accent pillows or wall art as well as neutral, wooden bedroom sets. Choosing cadet or cerulean blue for your bedroom can increase your home’s sale price by up to $1,800. 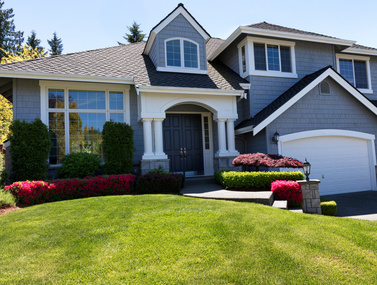 Light grey and beige (or “greige”) have become an incredibly popular choice for home exteriors. If you have wooden siding on your home, consider repainting it a neutral shade of light grey or beige before listing your home for sale. This choice has been found to boost your home’s sale price by nearly $3,500. If your home could use a fresh coat of paint anyway, painting it this color is a worthy investment before listing your home. Choosing a shade of light beige, oatmeal, or pale taupe for your living room can make your home sell for almost $2,000 more than you might otherwise expect. These shades of light brown will go well with everything, so feel free to choose red or blue sofas and throw pillows, orange rugs or black leather upholstery. Keep these surprising revelations in mind while you are trying to prepare your home to go on the market. Choosing the right shade of blue or other neutral colors for each room in your home can help your house sell quickly and for a good price.